Organizational appraisals systems are often ineffective and result in unnecessary spending on the part of a company and unnecessary anxiety on the part of employees. 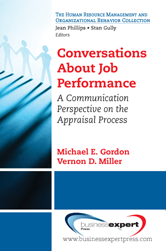 Written for practitioners and advanced students, this book presents an alternative approach to the performance appraisal process that focuses on communication rather than evaluation. In this communication-centered approach to performance, the appraisal process is designed to facilitate meaningful and open interaction between employees and their supervisors.